"Can you experience nostalgia for something that hasn't happened? We talk of 'regrets' about the course of our lives, when we are almost certain we have taken the wrong decision; but one can also be enveloped in a sweet and mysterious euphoria, a sort of nostalgia for what might have been." Laurent is a divorced bookseller in his forties who finds a discarded purse in the garbage on his way to work. The money and identity card have been stolen, but all the other contents remain. As Laurent goes through the items in the purse one by one, he begins to fall in love with the mysterious owner. But can the clues he finds in the purse lead him to the woman in real life? 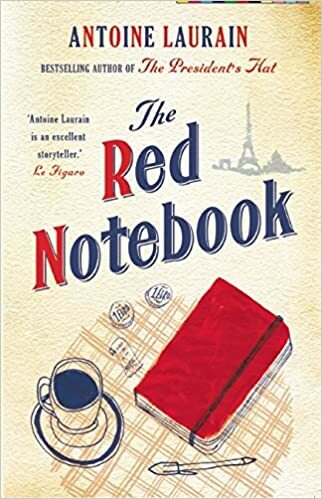 The Red Notebook by Antoine Laurain is a delight. I loved the characters. And the way Laurain writes. And how Laurent falls in love with a woman he knows only through the contents of her purse. This book is thoughtful, charming, funny, and wonderfully told. Definitely a bookish gem! I am looking forward to reading Antoine Laurain (and this book) again. Oh, the same author as The President's Hat--which I loved! When I added it to my wish list, I was pleased to see that I already had affection for this author. I still need to read The President's Hat...but I'm really looking forward to it; from what I've heard it's wonderful, too.